First on the list of Shows To See This Week is a gypsy jazz outfit heading south to play Columbus this weekend. 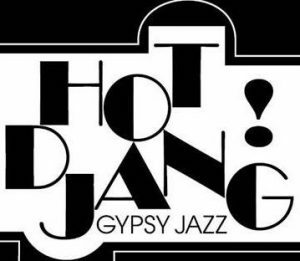 Cleveland area quartet Hot Djang plays Notes on Friday, April 13th at 8pm. Doors open at 7pm – tickets and more details are available here. Featuring Reed Simon on violin, Kevin Richards on lead guitar, Brad Smedley on rhythm guitar, and Bryan Thomas on upright bass, Hot Djang draws inspiration from Django Reinhardt and Stephane Grapelli, but also from classic swing and early jazz tunes. See below for video of the band in action, and keep reading for more previews of great jazz in the area this week. Saturday, April 14th (7:30 – 10pm): 8th Annual Vaughn Wiester Music Scholarship Fundraiser with the Famous Jazz Orchestra at Knox County Memorial Theatre, Mount Vernon. Due to repairs to the Clintonville Woman’s Club, the FJO has been off on the past two Mondays. So if you need a big band fix and would like to support a good cause, there is a Jazz Road Trip Saturday you may be interested in. Esteemed bandleader Wiester, who grew up in Mount Vernon, returns to his stomping grounds for an annual benefit for the Community Foundation Music Scholarship Fund established in his honor. The Vaughn Wiester Music Scholarship will be awarded at the event to an aspiring instrumentalist or vocalist who is a graduating high school senior residing in Knox County. And of course, the full Famous Jazz Orchestra will perform, featuring vocals from Rachel Sepulveda and Bailey Snyder – last year’s scholarship winner who is currently attending Mount Vernon Nazarene University. Admission is free, so make the drive northeast for a fun night of classic big band. More details are available here. And if a drive won’t fit into your weekend schedule, the FJO is back in action at their regularly Monday gig at the Woman’s Club on the 16th, with an appearance by vocalist Tia Harris. Thursday, April 19th (9pm – midnight): Jazz/Noise Collaborative Orchestra (JNCO): A Wall of Horns with Turner Matthews at Cafe Bourbon Street, Old North Columbus. For two years now, an eclectic community of musicians with varied interests has gathered on the third Thursday of most months for a multi-genre jam session, often including performances by special guests. The 24th installment next week will bring Turner Matthews to the stage. Matthews is a multi-instrumentalist, instrument-maker, and composer who leads experimental outfit Triangulus and has collaborated with Radarhill. Matthews’ 10:30pm set will be sandwiched by open jams, so bring your horn and get out there. A small donation is suggested for Matthews’ performance.